MoonProject – The Martian Review – Out of this world! You are here: Home » Featured » The Martian Review – Out of this world! 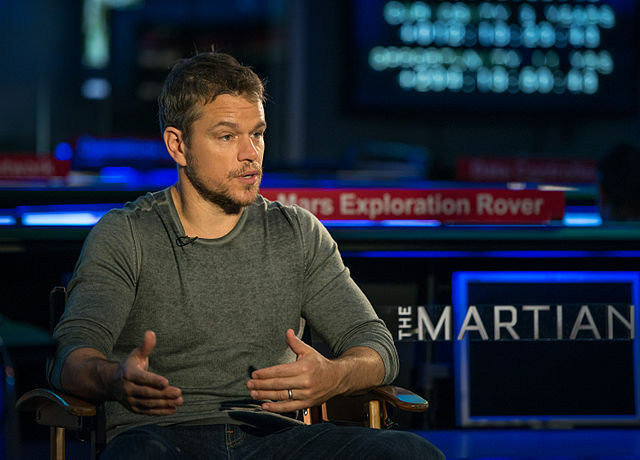 The Martian Review – Out of this world! Please note, this review contains minor spoilers. After a mission to Mars has to be cut short due to adverse weather conditions, astronaut/botanist Mark Watney (Damon) is left isolated on the red planet with only his wits and his will to survive. With limited resources, and the hope of rescue years away, Watney must use his skills in order to sustain himself and try to make contact with NASA. Back on Earth, Watney is presumed dead, however when successful contact is eventually made, NASA must do everything they can in order to bring him home. I was incredibly excited for this film as the trailers showed a lot of promise, the cast looked amazing, and it’s Ridley Scott directing. I’m happy to report that it did not let me down at all, and in fact far surpassed my already high expectations. There were so many things to like in this film, but I’ll try and unpack just a few of the highlights. Visually, it is absolutely beautiful to look at, and the cinematography is amazing. Wide, sweeping shots of the Mars landscape show it’s vastness but also how desolate, barren and lonely it is. I’m a big fan of symmetry in films (see my feature on 2001: A Space Odyssey for further evidence), and there are some beautifully framed and shot scenes in this film. I also loved the interesting camera changes, particularly in the beginning as it switched frantically from shots of the characters in the increasingly volatile conditions, to shots from inside their space suits to show things from their perspective. There’s no establishing of characters or plotline; we’re thrown right into the action, and the hectic camera changes help to create a lot of tension and excitement straightaway. There is wonderful simplicity in the shots as well. There is one particular scene where Watney has just successfully grown his first plant on Mars, and a close-up of the sapling then cuts immediately to a shot of earth from space. The contrast between this tiny plant and the vastness of Earth is expertly done. This plant is a lifeline to Watney and his only chance of survival so to him it is the most important thing in the world at that time, but in reality it is incredibly tiny and insignificant compared to how huge space is, and the environment Watney finds himself in. Tonally this film was a lot funnier than I expected, but that is certainly not a bad thing. It was able to balance the more comedic moments with intense drama, and the transition between the two was smooth and didn’t feel unsettling in any way. Having actors and actresses well known for comedic roles (Kristen Wiig, Jeff Daniels), and a whole host of well established talent made this tone very natural also. But when there’s drama, oh boy is there drama! The final half hour or so is on the edge of your seat, nail-biting, heart-stopping drama, and it is absolutely amazing. If I told you the soundtrack combined instrumental score and 1970s disco music, you’d probably think that sounded ridiculous. However, it worked for Guardians of the Galaxy with it’s 70s/80s influenced sound, and weirdly it works in The Martian as well. As with Guardians, it all makes sense and fits within the context of the storyline so it doesn’t seem out of place or odd. The soundtrack actually provides some of the comic relief as well as the grounding to reality for Watney, and the balance between score and soundtrack was just right. Films in this genre have the tendency to fall into cliches (think Armageddon, Deep Impact etc. ), and whilst The Martian had the odd throwaway line here and there which made me cringe a little bit, on the whole, it was great. Watney gave a very real and honest voice, and his sarcastic quips made a refreshing change from the usual melodrama in films like this. It was also refreshing to see logic and problem solving at work, rather than a “miracle” or being rescued through the heroic actions of one valiant person. I mean really there’s very little to fault here. There was one scene, when we first discover Watney is alive on Mars, that I feel could have done without instrumental score. Silence, and the focus on his heavy breathing would have better conveyed the quietness, isolation, and desperation of his circumstances. Overall I thought the score was great, but in this one scene a little bit distracting. Gravity used the silence of space to it’s advantage which was very effective, and this could have worked well in some moments in The Martian also. As previously hinted at, there’s a handful of lines which were unnecessarily cliche. Sean Bean’s character asking, “Do you believe in God? … Well we need all the help we can get”, could have been lifted straight out of any other space-set disaster/rescue movie and wasn’t needed here. What are you still doing sitting here and reading this review? Go and see this film now! It’s amazing, and absolutely one that you need to see in the cinema for the full experience. I can only attempt to convey why and how it is so amazing, but honestly you need to see it for yourself. Easily one of the best films I’ve seen this year; do not miss it! Author: sarah_buddery I'm 24 years old, love music, films and American Sport. Obsessed with Marvel, and am an unashamed nerd!